The JY-9 is a mobile S-Band low-altitude search radar intended for use in air defence, gap-filling, airport surveillance and coastal defence. It is designed for the effective detection of targets at low altitude in both electronic countermeasures and natural clutter environments. 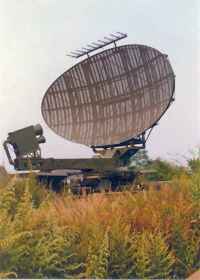 It consists of an antenna, a radar/operations shelter and a small power trailer, and is transportable by air, rail and sea. Setting up or disassembly time with an experienced crew of four men is 20 minutes. The JY-9 employs a dual beam antenna assembly consisting of a deformed parabolic reflector, two horns and two feed channels. The upper and lower beams cross at 5º elevation. One channel is used for transmit, both are used for receive. The antenna has an aperture of 4.14·6.96 m, and can be mounted on the shelter, on the ground or on a steel tower. The Transmitter uses a Crossed Field Amplifier (CFA) driven by a Traveling Wave Tube (TWT). The transmitted waveform is quadriphase intrapulse modulated. The JY-9 has high anti-jamming and anti-clutter capability, including pulse-to-pulse frequency agility, dual channel, pulse compression, a wide operating band, low sidelobes, moving target detection automatic spectrum processing, automatic clutter map, and automatic residue map. Mean time between failure is better than 500 hours, a built-in test subsystem is included, and automatic fault detection reaches the level of functional modules.